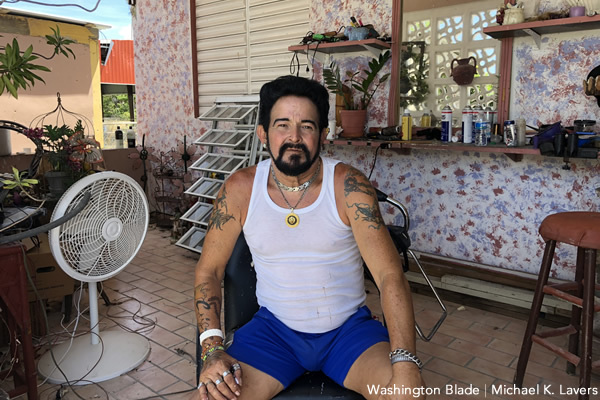 HUMACAO, Puerto Rico — A gay hairdresser in Puerto Rico who the Washington Blade profiled earlier this year says the situation for him and his family has improved “a lot” since electricity was restored at their home. Hurricane Maria made landfall near Humacao on Sept. 20, 2017, with 155 mph winds. Maria caused extensive damage to the second floor of Santiago’s family’s house in which he was living. Maria also destroyed Santiago’s hair salon that was in the backyard. Electricity was restored to Santiago’s home on March 31. Santiago laughed when he pointed out electricity was restored at his sister’s home in a nearby neighborhood the day before he spoke with the Blade. “She came here like a crazy woman and said, ‘I have power! I have power, after eight months,” he recalled. Handwritten signs the Blade saw throughout Humacao over the weekend indicate people still do not have electricity more than eight months after Maria made landfall. 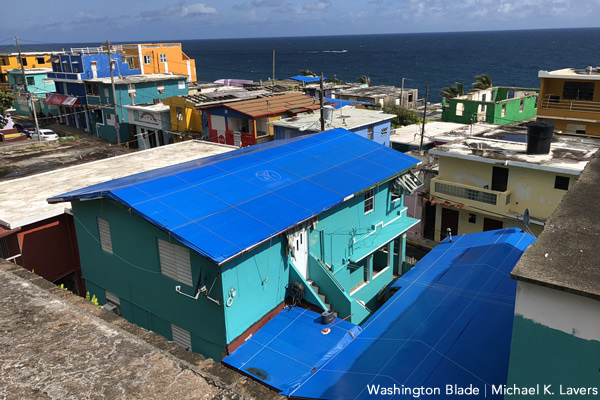 Damaged utility poles and houses with temporary roofs — blue tarps or “techos azules” in Puerto Rican Spanish — remain commonplace throughout Santiago’s neighborhood. The Puerto Rican government says Maria killed 64 people on the island, but estimates indicate the death toll is likely much higher. The New England Journal of Medicine on Tuesday reported researchers from the Harvard T.H. Chan School of Public Health, the Harvard François-Xavier Bagnoud Center for Health and Human Rights, Beth Israel Deaconess Medical Center in Boston, the University of Colorado School of Medicine and other institutions have concluded Maria may have killed an estimated 4,645 people. The New England Journal of Medicine reported researchers have concluded the “interruption of medical care was the primary cause of sustained high mortality rates” in the three months after the hurricane made landfall. Santiago is currently living with his mother, his father who has been bedridden for 15 years, two of his aunts and three Chihuahuas on the first floor of the family’s house. Santiago sleeps on a twin size mattress that he places on the living room floor each night. 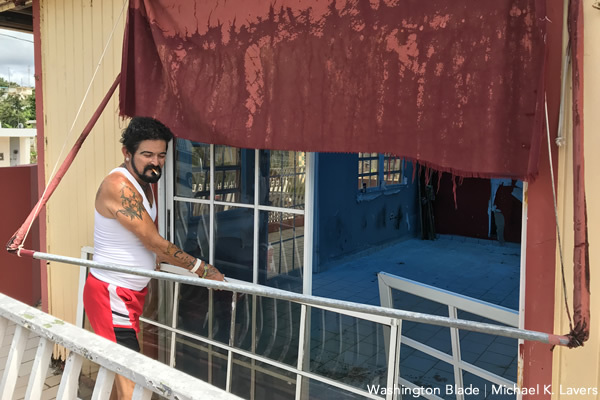 Santiago received $6,000 from the Federal Emergency Management Agency to repair his family’s house and salon, which FEMA determined was part of his home. 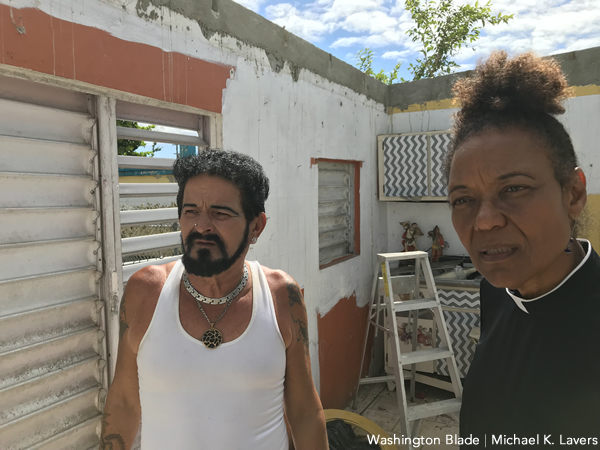 FEMA denied Santiago’s mother’s request for assistance because it concluded Maria did not damage the first floor of the house that it determined is her home, even though water caused extensive damage to the concrete ceiling after portions of the second floor’s roof blew away. Exposed rebar in the living room ceiling remains clearly visible. Santiago and his mother used the money he received from FEMA to remove what was left of the house’s second floor and seal the floor to prevent water from seeping through the ceiling. They have also painted the walls and repaired the gutters in order to reduce the risk of flooding. Santiago has turned a covered patio along the side of his family’s house into his salon. Santiago is converting the building in which his salon was located before Maria into his new home. Waves Ahead earlier this month launched ReconstruyeQ, a campaign that is helping Santiago’s family and nine other families in the U.S. commonwealth repair their homes and replace furniture and other items they lost during the storm. Waves Ahead is also working with San Juan Mayor Carmen Yulín Cruz and her administration to open a community center for LGBT elders. Wilfred Labiosa and Grissel Bonilla, who co-founded Waves Ahead, met with Cruz on May 23. Human Rights Campaign Foundation Director of Faith Outreach and Training Lisbeth Meléndez Rivera, who grew up in the city of Caguas that is located outside of San Juan, is among those who also attended the meeting. 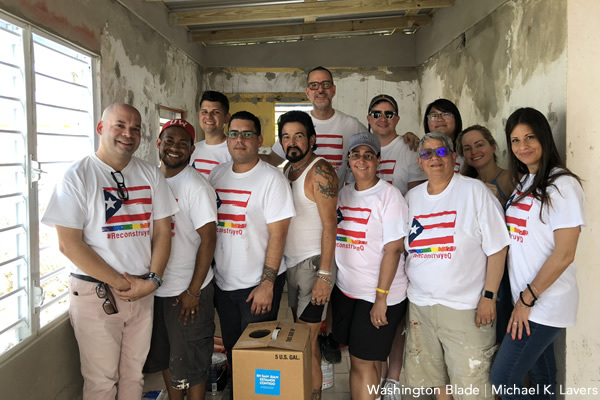 “An agreement to collaborate with the Autonomous Municipality of San Juan to secure a restored location in the city that will serve as a base for the first community center for Puerto Rico’s older LGBT community was discussed,” said Cruz in a press release, according to Primera Hora, a Puerto Rican newspaper. Waves Ahead posted to its Twitter account pictures of the meeting with Cruz. Construction crews earlier this month installed a new roof on Santiago’s new home. Santiago over the Memorial Day weekend helped volunteers from the Human Rights Campaign and other groups paint the walls. Waves Ahead and its volunteers also bought Santiago a new bed, a dining room table and chairs, a medicine cabinet and shelves. Santiago told the Blade he hopes to be able to move into his new home in the coming days. He said Waves Ahead and the volunteers who have helped him and his family have been “tremendous.” Santiago became emotional as he talked with the Blade about the assistance that he and his family have received. “It is an experience that I will have in my heart until I die,” he told the Blade. Santiago’s mother on Sunday said as she sat in her living room with two of Santiago’s aunts and two of the family’s three Chihuahuas that Santiago would have “nothing” if Waves Ahead and its volunteers were not helping him. The mattress on which Santiago is sleeping was along one of the walls and his clothes were draped over the top of it as she spoke with the Blade. One of Santiago’s aunts on May 26 began to cry as she talked her family’s experience during Maria. Hurricane season begins on Friday.